'Heart Attack Grill' Greeter Dies After Heart Attack : The Two-Way The restaurant's slogan is "taste worth dying for!" 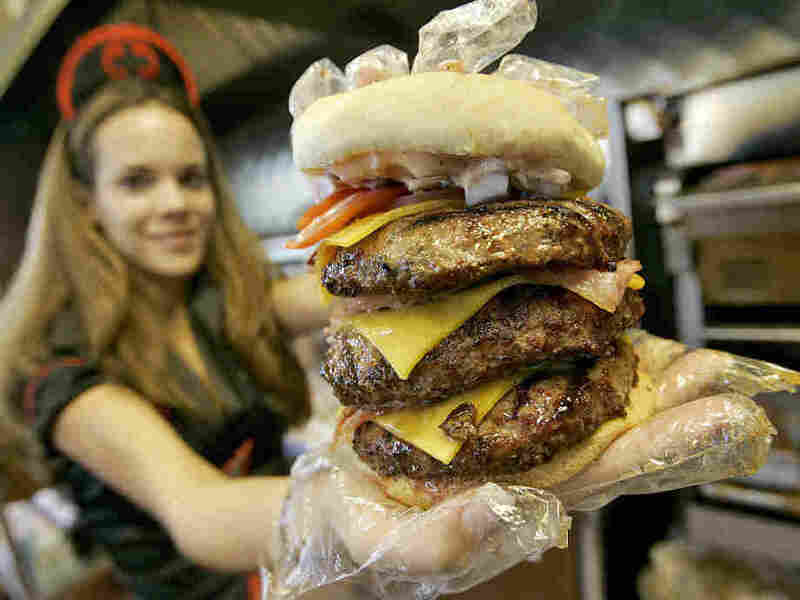 Its menu includes "Flatliner Fries" and a burger that packs about 10,000 calories. John Alleman had been its "unofficial spokesman" for more than a year. One of the Heart Attack Grill's "triple bypass" burgers. Two customers' collapses last year didn't seem to faze fans of Las Vegas' Heart Attack Grill. Now there's word from the Las Vegas Sun that John Alleman, an unpaid and unofficial spokesman for the restaurant who stood outside its doors every day to greet customers, has died after suffering a heart attack last week. Alleman, 52, was at a bus stop outside the restaurant when he was stricken. Grill owner Jon Basso tells the Sun that Alleman's death isn't going to mean the demise of "Flatliner Fries" or what the restaurant says is the world's "most calorific burger." We're talking 10,000 calories. "The grill is where you can be yourself. We accept people as they are," Basso says in the Sun's report. "(Alleman's death) isn't going to stop us from what we're doing. People have got to live their lives." On its Facebook page, the restaurant writes that "John was such a part of the HAG family. It's hard to look at our menu today without getting teary eyed." Alleman, by the way, reportedly weighed about 180 pounds. An earlier unofficial spokesman for the restaurant, Blair "Gentle Giant" River, died in March 2011 of pneumonia. He weighed about 575 pounds.